Ash-o-graphs with Catherine Schuller-Gruenwald – Sunday Aug 14th – Pittsburgh Mills! 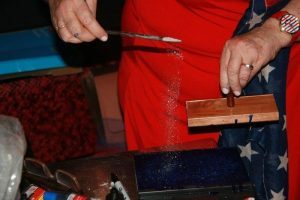 Catherine Schuller-Gruenwald, widow of Captain America writer and long-time Marvel executive editor, Mark Gruenwald, is returning to her hometown of Pittsburgh on the weekend of August 12-14th to visit two comic book stores where she will be greeting fans and doing live Ash-o-graph™ stamping of a commemorative piece created for the recent New York City June 14th Marvel tribute. The Ash-o-graph will be a one-of-a-kind invention of Gruenwald’s containing cremains-and-ink in the stamp of his autograph . Catherine will also be part of the auspicious closing ceremony for the Toonseum’s Captain America exhibit on August 13th. A native of Pittsburgh, Catherine was raised in the Duquesne Heights section of Mt. 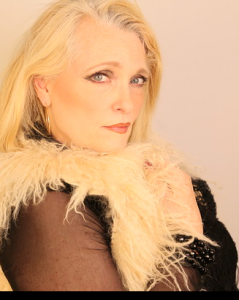 Washington and attended South Hills High School and graduated Chatham University before leaving for New York with her Pittsburgh born drummer boyfriend, the late Bill O’Connor, who later became the drummer in the Stilletoes and later Blondie. Catherine met Mark in 1990 while she was modeling and auditioning for models to work as superhero characters at Comic Con! Catherine was married to Mark in 1992 until his shocking and untimely death by a Monday morning heart attack in 1996. Twenty years after his passing, the industry is still remembering his contributions as one of the brightest and best editors to ever work in the Marvel Universe. Gru, as he was called, was known as the “continuity cop” at Marvel, and had an encyclopedic knowledge of all the characters in the Marvel Universe, being responsible for the consistency of the thousands of characters and plot lines for all of the Marvel titles published. 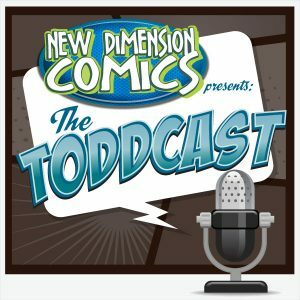 He worked on many funny books, contributing stories of unique scope, but his “babies” were Quasar, whom he created, and a ten year plus stint of writing Captain America, longer than Stan Lee himself. 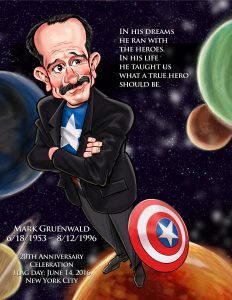 Mark Gruenwald was the very heart and soul of the Marvel Universe. He considered himself the consummate “fan turned pro” after joining the ranks of Marvel Comics in the late 70s when Jim Shooter, then editor in chief, hired him after reading his self-published underground publication entitled Fictional Reality produced by Alternity Enterprises, a precursor to his later creation the Official Handbook of the Marvel Universe. He rose to become the Number Two Guy as Senior Executive Editor under Tom DeFalco. The two were a perfect match and had a deep respect and irreverent love for each other. Catherine and Mark jointly masterminded the annual second best “company picnic” (John Byrne’s was first) in the entire comic book industry holding the well- attended, annual party celebrating Mark’s Birthday (June 18) and Cap’s favorite holiday, Flag Day (June 14). 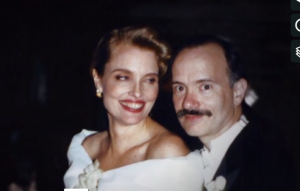 Their country house with its sprawling 7 acres in Pawling, New York was the backdrop for the fertile mind of Mark and his merriment and legendary engagement of everyone who ever visited his property was quite entertaining. He brought everyone into his giant scheme of activities for the day and a wonderful and memorable time was had by all. This year, in that tradition, Catherine sought to recreate and rekindle those auspicious times by staging a 20 year commemorative celebration in New York City to honor of his 20th year passing, his birthday and Flag Day once again. Not to mention that it’s Marvel’s 75 anniversary and the release of Captain America: Civil War has broken all box office proceeds to date. Captain America is at the pinnacle of popularity now, something Mark would have been duly proud of seeing as he had the daunting and challenging task of making Cap relevant during the 70s and 80s when Anti-American sentiment was at an all time high. Writing a patriotic character was an assignment that he took on with fervor for those ten years. Shortly after his death, at one of the many gatherings and tributes in his memory, Marvel stated that “In his dreams he ran with the heroes, in his life he taught us what a hero could be.” Touching and fitting for a boy from Wisconsin who wanted to have something deep and profound to believe in and contribute to the world of comic books he so loved as a young child growing up in the idyllic 50s and 60s in the heartland of America. His father was a comic geek and school teacher and imparted his love of mythology and heroic tales of folklore upon his young son, Mark. The industry-wide Flag Day extravaganza followed Mark Gruenwald Week, examining his career in depth, culminating in the 20 year party saluting Mark and featuring activities he would have loved including: an industry panel discussing his contributions to the industry both in his writing and office antics, extravagant performances in the form of hip hop dancers, modern ballet routines, and all the attendees in costume or flag regalia sporting red, white and blue in their expression of choice. Betsy Ross, Uncle Sam, Neil Armstrong, Captain America, Silver Surfer and other MADCAP (one of Marks’actual characters) merriment defined the night. There were artists creating live comic book art on the spot during the event, and a fashion show of Captain America inspired clothing from designers at Burning Guitars, and a giant birthday cake in the form of Cap’s shield which was donated from Cake Boss who served up a slice for everyone in attendance that night. He was a fairly good guitarist and songwriter and actually wrote a song entitled “The Secret Art of Dying Twice.” The song was played at his 20th year tribute when Catherine accidentally found an old cassette of Mark’s doodlings. How prophetic and uncannily prescient of him to write his own eulogy in a way!! His premonition came true perhaps as he staged a comeback of sorts with the ash/ink legacy wish. Ever the creative genius, it was befitting that the key in-gru-dient to the night’s festivities was a new twist on the ink/ash final wish. This interpretative installment consists of a commemorative drawing by his cousin, Ed Steckley, which was stamped on the back with his autograph and the ink with cremains mixed into it right in front of the fans. Thus was born the Ash-o-graph™! The meaning of Mark’s life lives on, as the bar is raised on significance and elevated again by having Catherine stamp his autograph with ink and ashes mixed onto the ink pad right before everyone’s eyes and stamped onto the back of this highly collectible, limited edition, commemorative piece. Mark was and is the ultimate prankster and was always writing about alternative realities, parallel universes, portals, ghostly realms, other worlds, etc. so it is TruGru that he would give back to the fans in this creepy and cool way. At every Comic Con he was the ringleader of the audience participation games involving all manner of comic book trivia and, in that vein we are going to seek to elevate his status and honor the man who was most proud of the fact that his very initials were the same as Marvel Entertainment Group. He was and always will be a Marvel Man for all eternity, here and beyond. Mark kept track of how many days old he was, and if he had lived he would be 22, 995 days old this year on his birthday. He once said, “You are never too young to die” and that he could not imagine not having a significant life. 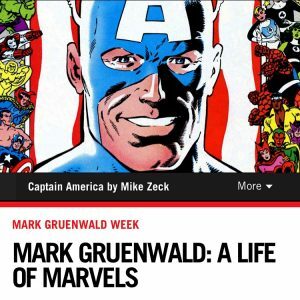 Come be part of comics history while Catherine visits her hometown Sunday August 14 at New Dimension Comics Pittsburgh Mills from noon until 4 and own your piece of Mark Gruenwald. He was known to “throw himself into his work” and his love and respect for his fans is Catherine’s mission to recreate and honor his comic contribution in a novel and totally unique, (uh hum, “Gru-nique”) way this special year.